A starchy substance extracted from the root of the CASSAVA plant. 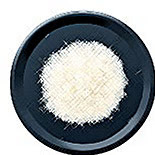 It's available in several forms including granules, flakes, pellets (called pearl tapioca ) and flour or starch. The most widely available forms are tapioca flour (also called cassava flour ) and pearl tapioca. The flour is used as a thickening agent for soups, fruit fillings, glazes, etc., much like CORNSTARCH. Pearl tapioca is used mainly to make pudding and comes in several sizes, regular or instant forms and in a variety of prepackaged flavors. Pearl tapioca is available in most supermarkets, whereas the other forms are more commonly found in health-food stores and Asian markets. If stored in a cool, dark place, all types of tapioca will keep indefinitely.